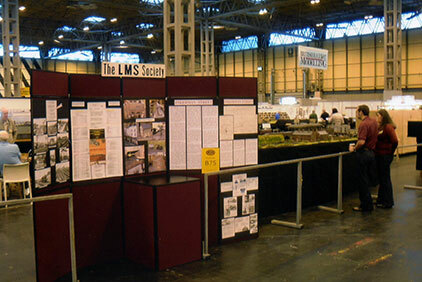 After a two year absence from the Warley show, the Society's presence this year marked the return to the exhibition scene for Michael Byng's 7mm scale Inkerman Street layout, following extensive refurbishment, after more than twenty years out of the public eye. It was first exhibited at the Manchester exhibition in 1988, and an album of close-up detail photographs was produced, which to this day remains a sought after publication, despite the fact is was black and white, not colour. The electrics, track and buildings have all been refurbished and/or rebuilt to a greater or lesser extent, to correct passage-of-time deterioration. The large warehouse and other buildings backdrop originally used at the rear of the layout, had deteriorated to such an extent they were beyond restoration. Over the past year, much refurbishment work has been carried out by Michael Byng, Chairman, David Hunt, Michael Holland, and George Godfrey, with George overhauling the electrics, to ensure the layout would be operationally sound over the two days at Warley 2011. Vice-Chairman, Adrian Tester joined the 'working team' for the exhibition. The prospects for a terminus such as Inkerman Street continuing without alteration, has been considered by Michael and the operating team during restoration of the layout, particularly the ongoing feasibility and 'railway business case' as to whether a two platform surburban station set in the inner Manchester area, would have been built. As a result, the 'business case' approach for the line suggests it should be converted to become a through station, with storage yards at each end of the layout providing for more varied and intensive passenger services to be run. The low level goods line will also have a storage yard at the left end, with the right end being developed as the Pomona dock end, and this change will allow the goods yard lines to be worked more realistically, and independently of the higher level. Explanatory boards on the Society stand outlined the rationality behind the proposed changes, and resulted in many expressing a view that through station running, and a separately operational goods yard, would considerably enhance the Inkerman Street spectacle. The 15½ hours of public operation over two days, were exacting for the operating team, with the depth of interest from the sometimes 6-7 deep group of interested observers across the front of the layout, confirming not only that the 'Inkerman Street' layout presence still has its course to run, but also that the operating team's determined efforts were greatly appreciated throughout the two days. Read Michael Holland's account of the restoration and rational of the 'new' Inkerman Street here. General view showing the high level island station, with the long siding at the lower level in front of the two-track goods yard and town buildings, leading to the imaginary Pomona Dock area. A superb rake of three non- corridor LMS carriages, awaits departure behind an LMS 0-6-0 tank engine. Also seen in the goods yard is George Godfrey's highly detailed model of an LMS Walker/Pagefield 6 ton Cruiser Type Mobile Crane, several of which were bought by the LMS for use in goods yards in the 1930s, and whilst such a crane was intended for the larger goods yards, there might have been a load arrival which necessitated the use of the crane!! The two drays, one an ex-L&YR type, and an LMS ST32, await their next duty! The left end of the layout, with the high level bridge across both tracks providing an effective break between layout and the non-scenic storage tracks. 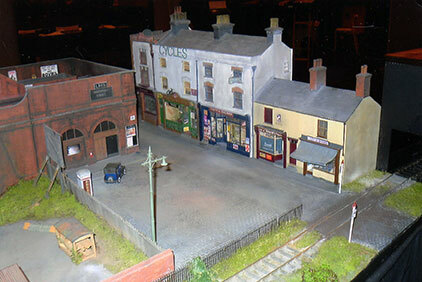 The detailed buildings attracted a lot of favourable comments, with the Inkerman St. station entrance and bricked station forecourt, and a highly detailed row of shops with very credible 1920-30s period window displays, together with the layout's two properly cambered roads, one of which is seen in this view. 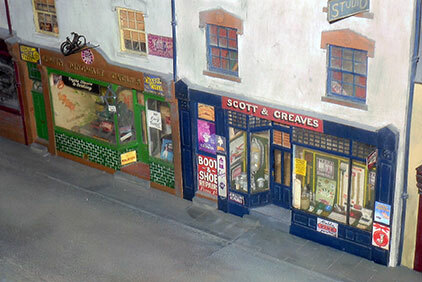 Two of several very realistic shop windows, with some interesting detail also seen through the upper floor windows, and the cycle above the door! This small shop has 'Cadbury's Chocolates' advertising above the entrance door, through which the brown and white tiled floor is seen, whilst a 'STIRRUP PUMP KEPT HERE' plate to the right, and metal advertising plates, provide a reminder of the 1920-40s era. The sharp-topped metal fencing separates the roadway from railway property. 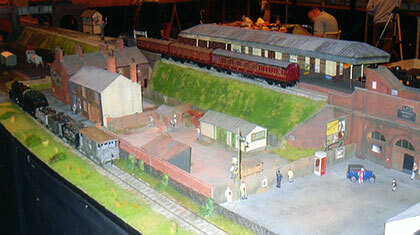 A view of the left end of the layout, again with many interesting aspects seen. The timber & and asbestos building close to the embankment was typical of those the LMS introduced during the early 1930s as part of a scheme to expand distribution and small rail-head storage accommodation. 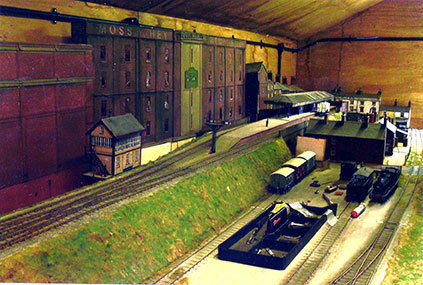 This view of the layout in Michael Byng's large shed, shows the important visual impact of having large warehouse buildings as a back-drop, and adds much credibility to the rail-head area. 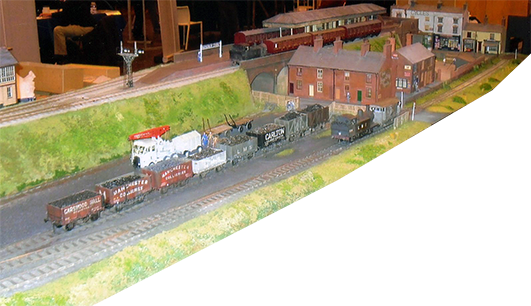 The proposed conversion of the terminus to through station, with fiddle yards at both ends at high and low levels, will assist more realistic operation of the layout. Unfortunately, the warehouse frontages seen in this view, deteriorated to a point beyond restoration, and therefore, new back-scene buildings will be required.